Specific programs that deal with the needs of your organization. Sitting disease is one of the most threatening diseases of the Western world. It affects more people than all cancers combined causing high health care costs, absenteeism, and pain. Let our trained individuals at Atlanta Mobile Massage and Wellness bring movement back into your workday. Through our comprehensive movements, we will not only strengthen weak muscles but reduce pain and alleviate headaches. 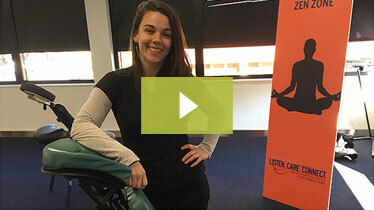 Did you know you can eliminate Sitting Disease with 10min of simple movements 3x a day? We did. Let us show you how you can save your life and bring wellness to your day. Marvelous Mondays: What if your employees looked forward to Monday? What if Monday became a fresh start instead of a drag? Atlanta Mobile Massage and Wellness can help. Let our team bring pizazz and fun into your Mondays so that everyone is looking forward to the beginning of the week and keeps the high energy going. Wellness Wednesday: What better way to get through the hump than with Wellness? Massage, yoga, and movement can give the middle of the week the bump it needs to make it to the end. Let the trained professionals at Atlanta Mobile Massage and Wellness help you feel great. With massage, yoga, movement education, or a high energy fitness session, we can put the Well in Wednesday. Fantastic Friday: It has been a hard week, your team is feeling fatigued and taxed. Let Atlanta Mobile Massage and Wellness help say thank you to the team for all their hard week. Massage and yoga are a great ways to leave your team feeling great and ready for the next week. What better way to start the weekend than with reducing stress and feeling pain free? All companies have things that are working great and areas that need improvement. Talk with our trained professionals to create a specific seminar that deals with the needs of your company or choose from our menu below. Poor workplace design leads to employees with pain, frustration and lower morale. In this seminar we will review techniques for sitting properly at a desk as well as assess the overall ergonomic health of your office. According to the American Psychological Association's (APA) over 65% of Americans site work as their largest source of stress. This seminar discusses what Workplace Stress is and provides tools to combat the issues within your organization. Sitting for long periods of time has severe consequences on your health. In this seminar we will review the risks as well as some helpful stretching exercises to keep your body well primed for the workplace. Here we will review the techniques for proper posture and how you can correct your posture to reduce body pains and for an overall healthier workstyle. Don't see a topic you like? Contact us and we'll will custom-create a seminar specific to your organization.